Our mission statement “To produce products that defy preconceptions and transform the idea of excellence at balanced price” is the basis for the values and rules that space is committed to follow and upholds in our everyday activities. Development and application of technology represents an opportunity that is central to our image and competitive advantage. We are focused on developing technology that is expected to deliver the most promising long term results. Developments in software and manufacturing technologies are constantly being driven onwards and applied to new and existing products. We constantly aim to earn our customers’ trust by providing dependable products and services, fast deliveries, and reliable support. We promote a culture of innovation and responsibility that ensures our quality management systems is continuously evolving to meet our customers’ highest requirements. We aim to promote and sustain growth through innovative enterprise. Through developing innovative technologies centering on the field of automation, we create products that contribute to safer, more comfortable and enhanced entrance for our customers. At SPACE, we facilitate knowledge building and knowledge sharing. We encourage our workforce to, not only work consistently and accurately, but to acquire knowledge about the work that they do, so that they may better understand how to ensure that the products are manufactured according to our company’s standards. We deeply care about how we deliver excellent products at balanced price. Never will we compromise safety or quality to offer better price. Our activities and research are focused on developing superior processes driving simplicity, effectiveness and efficiency, to deliver products at balanced price to our customers. We are happy to answer your inquiries! At SPACE we seek to continuously expand. Get in touch with Space Autodoor Automatic Door experts via QQ! 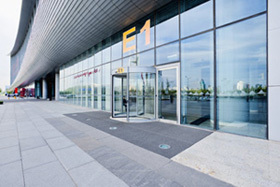 Get in touch with Space Autodoor Automatic Door experts via Skype! Get in touch with Space Autodoor Automatic Door experts via Trademanager!